What scientific research exists documenting the effectiveness of the ACZ nano as a detoxifier of toxic heavy metals? Urine challenge (post-provocation) tests are the "gold standard" to measure the effectiveness of any chelating agent. Many tests have been performed using ACZ nano as the chelating agent to demonstrate its superior effectiveness in irreversible binding of Mercury and other toxic heavy metals. It is important to compare a challenge (post-provocation) to a baseline (pre-provocation) test for scientific validity. Usually, the baseline test will demonstrate no presence of toxic heavy metals in the baseline urine because there is no detoxifier present. If we could mobilize and excrete toxic heavy metals out of the body without a detoxifier, then by definition the body wouldn't be toxic. We simply don't have the biochemical pathways available to handle the tremendous toxic load that we now all experience and cannot mobilize and excrete toxic heavy metals without the help of ACZ nano. The ACZ nano challenge (post-provocation) is performed by a person taking the ACZ nano three times during the day and collecting all of the urine that is excreted during that time. These tests scientifically demonstrate the incredible effectiveness of the ACZ nano in the irreversible binding of the toxic heavy metals and excretion through the urinary tract. The binding affinity is also documented by the very high levels of Mercury present in the challenge (post-provocation) urine sample compared to the baseline urine sample. 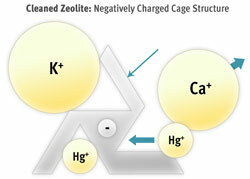 Another important aspect of the superior characteristics of ACZ nano as a detoxifier is also scientifically documented in urine challenge (post-provocation) tests, proving that Nutrient metals such as Calcium, Magnesium, Iron, Lithium, Silver and other critical elements are not bound by ACZ nano. The acid base detoxifiers, EDTA, DMS, DMSA do bind these Nutrient metals and remove them from the body leading to deficiencies and potentially serious side-effects. This type of scientific laboratory testing is available to you and your clients to demonstrate the effectiveness of the ACZ nano and to document the improvement over time as the toxic heavy metals are removed from the body. What is the most effective supplement I can take to rid my body of toxins? The most exciting newly available natural mineral for removing heavy metal toxins is ACZ nano. It has the capability to eliminate several kinds of toxins, viral sub-particles, allergens and heavy metals from the body. Zeolite is a naturally occurring crystal formed from volcanic ash over 300 million years ago. This crystalline compound has a cage-like, honeycomb structure, which is negatively charged and therefore attracts and captures harmful substances. The cleansing mechanism of ACZ nano is simple. With each dose, near countless numbers of sub micron size zeolite crystals enter the body as energized, negatively charged cages. As these crystal cages travel through the blood stream, heavy metals and free radicals attach to the zeolite crystal cages in an action similar to a magnet attracting iron filings. This unique exchange mechanism is called the cation exchange capacity. These toxin filled cages then pass naturally out of the body after only 5 to 7 hours. ACZ nano is capable of selectively attracting and binding toxic particles, whether they are heavy metals, radioactive particles, viruses, or other dangerous substances, and safely removing them before they negatively affect overall health. Not only does ACZ nano eliminate toxic buildup, it also enhances immune function, alkalizes the body, improves metabolic function and nutrient absorption, and improves the body's resistance to diseases like cancer through activity on the p21 suppressor onco-gene. Also, because ACZ nano comes pre-activated with health-promoting ions like calcium, magnesium, iron, and potassium, it provides a two-for-one benefit. The exchange removes toxins from the body and replaces them with essential nutrients. How long have zeolites been used to improve health? Zeolites have a long history in traditional medicine dating back at least a thousand years. Records show that the zeolite has been a part of traditional remedies throughout Asia. More recently zeolite powder was given to victims of the Chernobyl fallout to reduce radiation levels in their bodies. Twenty tons of zeolite was dumped on the Ukraine and Bellarus to bind the radioactive Strontium and Cesium. Zeolites have also been used for decades to improve the digestive health and weight gain of stock animals in Europe and the Mediterranean regions which long ago banned the use of hormones and antibiotics as growth promoters. Zeolites are now being recognized for their exceptional characteristics in promoting human health. How does ACZ nano remove heavy metals from the body? The most hazardous heavy metals when it comes to human health are mercury, lead, cadmium, and arsenic. Despite the known risks associated with heavy metal toxicity, exposure to these toxins continues to increase through the dental practice of using a mercury amalgam and the continued use of the mercury vaccine preservative Thimerosal. ACZ nano's negatively charged-matrix structure allows for the attraction, binding and removal of positively-charged particles from the body through a process called "cation exchange." The heavy metals with the highest affinity for the zeolite in order are: mercury, lead, aluminum, antimony, arsenic, barium, bismuth, cadmium, cesium, gadolinium, gallium, nickel, niobium, platinum, rubidium, thallium, thorium, tin, tungsten, uranium and others. The binding affinity is based upon charge, size, weight and density of these ions. Once in the structure, toxins are tightly bound and eliminated though the urinary tract from the body within hours. The long-term effects of using ACZ nano for heavy metal elimination could include reduced risks of cancer and heart disease. Is ACZ nano another form of oral chelation therapy? The short answer is YES. Chelation therapy was originally developed to treat heavy metal poisoning especially lead. The term "chemical binding" refers to the ability of a compound to combine with a heavy metal so the toxin can be excreted by the kidneys and liver during detoxification. Traditional chelation treatment generally involves taking certain chemicals such as acid-based EDTA, DMSA, and DMPS that have an affinity for certain heavy metals. Many negative effects can occur during acid-based chelation therapy due to the weak binding of the agents to the heavy metals that would allow the heavy metals to be re-deposited elsewhere in the body or brain and not be excreted. ACZ nano however irreversibly binds toxic heavy metals and quickly removes them through the urinary tract. ACZ nano is also able to correct pH by loosely attracting the large Hydrogen ion on the basis of concentration gradient and charge. Acid-based chelating agents make pH worse. The only symptom associated with taking lots of the ACZ nano is possible mild dehydration, which can be easily prevented by drinking plenty of fluids while using the supplement. Whereas acid-based chelation treatments also bind to essential minerals as well as possibly increasing the likelihood that some heavy metals will be absorbed by the body during therapy, ACZ nano does not have these same risks and does not have the same liver and kidney burden as acid-based detoxification treatment. Pregnant and nursing women are encouraged to use ACZ nano to help decrease toxins going through the placenta to the fetus and to detoxify the breast milk the infant requires. What are antioxidants and what are the antioxidant properties of ACZ nano? Although oxygen is necessary for proper cell function, cellular processes involving oxygen to create energy also result in oxidation. Oxidation is a chemical process that results in certain atoms losing electrons and becoming unstable. This is the same process that causes a coin to tarnish or a banana to turn brown. These destabilized molecules are known as free radicals, and they can cause cellular damage by stealing electrons from healthy cells. Between one and three percent of the oxygen we inhale results in the creation of free radicals, and our cells are exposed to billions of free radicals each day. If free radicals are not neutralized, they can cause premature aging, immune dysfunction and a myriad of diseases including cancer, cardiovascular disease, Alzheimer's and Parkinson's disease. ACZ nano has powerful antioxidant properties. Its structure not only traps toxins such as heavy metals, but also free radical molecules. However, unlike classic antioxidants, zeolites do not neutralize free radicals by donating an electron to stabilize them. Instead, the structure of the zeolite is such that it captures the free radical and locks it safely away so that it cannot harm the body. Once trapped in the zeolite, the inactivated free radical can then safely be eliminated from the body. Also, the more toxic metals residing in the body, the higher the free radical activity. Heavy metals in the body exponentially increase free radical activity and today everyone has far more heavy metals than ever. Thus, removing toxic metals from the body will greatly reduce the number and activity of free radicals. Can ACZ nano help with colds, flu and other viruses? Zeolite fights viral infections through a two-pronged approach. First, it is believed to attract and bind viral sub-particles, thereby interfering with viral replication in the body and halting its progression by eliminating them from the body. ACZ nano may also dampen viral proliferation. A study on the antiviral activity of micronized zeolite found that it slowed the proliferation of human enteroviruses and type-1 herpes simplex through nonspecific antiviral activity. The study suggested that there may be a therapeutic application for zeolite in the treatment of herpes virus (topical use) and enterovirus (oral use). In addition to its broad-spectrum antiviral properties, ACZ nano boosts immune function, which protects the body and helps it fight infection. By interfering with viruses themselves and boosting immunity, zeolite may offer the right combination of safe and natural immune support necessary for optimal health. Because zeolite removes heavy metals and other toxins from the body, the immune system is more likely to be healthier and better able to deal with microbial invaders. The rise of modern industry has resulted in an increase in cancer-causing chemicals and one of the great challenges of modern medical science is the task of preventing, treating and curing cancer. The potential for using zeolite to treat cancer has recently drawn the attention of some scientists. A growing body of evidence supports zeolite's role in cancer treatment. ACZ nano may help to eliminate carcinogenic toxins from the body, especially a category of carcinogens called nitrosamines. The most common sources for these nitrates include processed meats, cigarettes, and beer, and they have been linked to pancreatic, stomach, and colon cancers. Even with diet restrictions, most people still consume more nitrates than they should for optimal health. ACZ nano can reduce nitrate absorption as well as the absorption of several other carcinogenic substances. Even more interesting is research demonstrating the ability of zeolite to suppress tumor growth. Studies on cell models and in animals have been promising. In one study, zeolite was found to target certain tumor suppressor genes, thereby inhibiting tumor growth. In another study, zeolite was given to animals with varying types of cancer. Supplementation with zeolite led to tumor shrinkage and overall health improvement in some animals, with one of the most exciting results involving skin cancer. Although the degree of improvement varied depending on the animal and type of cancer, significant improvements were seen in some animals, and none suffered any side effects. ACZ nano's antioxidant properties may also prove beneficial to cancer patients since antioxidants have a long track record of aiding cancer treatment programs, though in some cases, the exact mechanism that makes antioxidants useful for cancer treatment is still not well understood. Can ACZ nano help control blood sugar levels? Research on using zeolite supplements for blood sugar control is encouraging. Zeolite's ability to effectively absorb excess glucose and, as a result, help regulate blood sugar levels makes it a positive adjunct in treating diabetes. As a side benefit, zeolite reduces nitrate uptake by capturing nitrates in the digestive tract before they can be absorbed. Nitrates have been linked to Type-2 Diabetes. How can ACZ nano counteract the effects of pesticides, dioxins and other pollutants? Although zeolite does not eliminate these toxin sources directly, it does provide a safe, nontoxic method of removing toxic-heavy metals, mitigating their damaging affects such as immune suppression and poisoning of the liver's detoxification pathways. A healthy liver and immune system are critical for protecting the body from the carcinogenic effects of pesticides, dioxin and other toxic chemicals. Can I use ACZ nano as part of a nutritional program for hormone balance? Yes, as the body detoxifies from poisons, the endocrine's system is able to heal and improve function. How does ACZ nano balance the body's pH levels and what health benefits does it provide? It is critical for proper cellular function that the body maintains a healthy pH balance of acid and alkaline levels in the body. A slightly alkalinity (a pH of 7.35-7.45) is considered optimal for good health. Blood pH is regulated by the body in several ways. The kidneys and lungs provide mechanisms for pH regulation while the kidneys remove excess Hydrogen ions called protons in a relatively slow process, and the lungs remove extra CO2 in a much faster process, often during exercise. The acid-alkaline equilibrium is also regulated by a series of acid-base buffers composed of a weak acid and a salt base. Zeolite's chemical makeup and its ability to attract excess Hydrogen ions based upon the concentration gradient helps correct and maintain a healthy body pH which reduces acid reflux symptoms, arthritis, infections, and cancer and improves overall cellulular function. Can ACZ nano improve digestion and nutrient absorption? Zeolite's digestive benefits have been well researched. Zeolite has been used with positive effect to treat the symptoms of diarrhea. In one animal study, ACZ nano was able to improve the symptoms of intestinal disease in test subjects. Later human studies confirmed zeolite's benefit in treating acute diarrhea symptoms and led to the approval of a pharmaceutical drug for this use called Enterex. ACZ nano promotes healthy digestion and encourages nutrient absorption. Zeolite's ability to capture ammonium ions during digestion, creating a friendlier and less toxic digestive system that is better able to absorb nutrients during digestion is believed to be the reason for this. It may also balance the pH of the digestive tract, creating an optimal environment for beneficial microflora in the digestive tract. Also, the binding of toxic heavy metals that compete for the same receptors in the gut provide for increased absorption and assimilation of the nutrient minerals such as calcium, magnesium and iron. Binding of the toxic heavy metals also reduces the damage that leads to "leaky gut syndrome." With a healthy, balanced digestive system, incidents of diarrhea, flu and infections are reduced. And since the body is better able to digest, absorb and assimilate essential nutrients when the intestinal tract is functioning properly, the overall health of the body improves as well. How can ACZ nano help those who suffer from chronic allergies? Some researchers believe that zeolite may also attract allergens and antigens that trigger allergies, capturing them and eliminating them from the body. ACZ nano may offer additional allergy support by reducing occurrences and symptoms of allergies and related conditions, including asthma. The immune system is key in this process. The toxic heavy metals mercury, cadmium and lead, particular adversely affect this system by interfering with metabolic pathways involving the Omega Fatty Acids. Omega 3 Fatty Acids are involved with anti-inflammatory pathways. Omega 6 and 9 Fatty Acids are involved with pro-inflammatory pathways producing such toxic substances as Histamine and Leukotrienes. These chemicals in high levels in the tissues cause asthma, allergic reactions, rheumatoid arthritis, SLE (Lupus) and other autoimmune based conditions. As the levels of toxic heavy metals decrease in the body, these pathways can be restored to proper function and balance and associated auto-immune conditions will markedly diminish. How can ACZ nano help to combat aging? Zeolite's ability to reduce toxic overload and its antioxidant properties may also prove beneficial in the fight against aging. Exposure to damaging oxidation and toxins interferes with metabolic functions and cellular repair. Detoxifying the body with a health-promoting supplement like zeolite helps to offset these effects and keeps the body's reparative and regenerative functions operating efficiently, keeping us young and healthy. How does ACZ nano support healthy immune function? ACZ nano can influence the health of the immune system in several ways. The most obvious effect zeolite has on immunity is its ability to remove toxins, heavy metals, and allergens from the body. All of these things have been known to negatively affect the immune system and seriously compromise overall immune health. Zeolite is also believed to have nonspecific antiviral properties. By eliminating these potential health threats, zeolite indirectly improves immune function. But that is not all. A growing body of evidence suggests that zeolite also has immunomodulatory effects. This means the chemical composition of zeolite may actually have nonspecific immuno-stimulating effects. Scientists believe that zeolite may be able to activate large groups of T cells. In a study on patients being treated for immunodeficiency, six to eight weeks of clinoptilolite zeolite was found to increase the blood counts of certain immune cells. How does ACZ nano remove only bad substances from the body? Studies on zeolite have shown that it has a great affinity for attracting heavy metals and other toxic particles. The size, shape, weight, density and electrical makeup of each toxic heavy metal is specific and binds tightly to the zeolite cavity. Meanwhile, nutrient minerals like calcium, magnesium and phosphorus are larger and lighter. ACZ nano is pre-activated with these healthy mineral ions, so when the zeolite binds onto a toxic particle, it leaves a healthy nutrient in its place. This is called cation exchange. Will ACZ nano damage dental fillings, artificial joints, or breast implants? ACZ nano can only remove heavy metals that are in a free solution. Zeolites operate passively; they will not attack foreign particles or pull mercury from fillings, titanium from hip replacements, or silicone from breast implants. Are there any side effects associated with taking ACZ nano? ACZ nano is considered 100 percent safe and non-toxic by the FDA. There are no documented side effects associated with using ACZ nano as a health supplement. Zeolite only remains in the body for between 5 and 7 hours, and it is considered safe for children, pregnant and nursing mothers, and the sick and elderly. It is recommended that anyone using ACZ nano remain well-hydrated since the process of removing toxic heavy metal ions from the body can result in slight dehydration. The recommended eight to ten glasses of water per day should suffice in most cases. If you have any concerns, please speak to a health professional. Are there any contraindications for using ACZ nano with any prescription drugs? There is no mechanism for interaction of zeolite with pharmaceutical drugs. The exception would be chemotherapy agents which contain heavy metals such as cis-Platinum. In this case, it is recommended to stop taking ACZ nano 48 hours prior to chemotherapy and to resume taking ACZ nano 48 hours after chemotherapy. People who are labeled Biploar Affective Disorder BAD or Manic/Depression are often prescribed a mineral supplement called Lithium. This therapy has been around since the 1940's. The affinity studies show minimal binding attraction for Lithium. A urine test is available to follow the Lithium levels as well as the blood test required every month. Lithium is very toxic with many sides-effects. Those who are taking Lithium would definitely benefit from removing the toxins from the brain, so that they can regain their function. Lithium does NOT fix brain toxicity problems. Aluminum in deodorants and makeup is said to be harmful to the body. Why isn't the aluminum in zeolite dangerous? The aluminum in ACZ nano is bonded in such a way that it cannot be absorbed by the body. Temperatures of more than 900 degrees Fahrenheit would be required to break the metal from its crystalline bond. In fact, ACZ nano removes existing aluminum that has accumulated in the body just as it removes other heavy metals. Can ACZ nano negatively affect liver or kidney function? There are no reported problems associated with ACZ nano negatively affecting liver or kidney function. By detoxifying the body, zeolite may actually improve function by making the job of the liver and kidneys much easier. By reducing the strain on the organs from dangerous toxins, supplementation with ACZ nano may lead to a healthier liver and kidneys. The most common source of kidney dysfunction is lead toxicity. Using zeolite, kidney function often improves. Is ACZ nano safe for children? Children are exposed to the same toxins as adults, and in some cases their environment may be more toxic. Because children's immune, neurological and endocrine systems are actually less developed than the typical adult, they also may be more susceptible to these toxins. Not only is ACZ nano completely safe for children (though they should consume a dose proportionate to their weight), it may prove even more beneficial for children than adults because all of their systems are still developing. Is ACZ nano safe for pregnant or nursing women? The FDA considers zeolite safe and nontoxic, regardless of age or gender. Since it is also excreted in its entirety, zeolite will not accumulate in the body and should be considered safe for pregnant and nursing women. A recent Red Cross study found more than 200 toxic compounds, nearly half of them carcinogenic, in the umbilical cord blood of newborn babies. ACZ nano may provide optimal health for mother and child. How long does zeolite stay in the body? Can zeolite accumulate in the body over time? Zeolite is eliminated from the body completely and does not accumulate with time. ACZ nano has a half-life of 5-7 hours. That means half of the dose is gone during that time frame. It takes five half-lives for all of an agent to be processed out of the body. Five times 5-7 hours means it takes 25-35 hours for total excretion of the zeolite dose. What is the recommended dosage of ACZ nano? Maintenance Dose:Take 5 sprays by mouth 2-3 times daily. Higher Dose: Take 10 sprays by mouth 4 times daily. Is it better to take ACZ nano with food or on an empty stomach? Unlike other detoxification therapies where the presence of food in the stomach may affect the absorbability or effectiveness of the treatment, ACZ nano is just as effective whether taken with food or without. What does ACZ nano taste like? ACZ nano is tasteless so it is easy to incorporate into any diet, even that of the pickiest eater, the elderly and the smallest child. After starting to take ACZ nano, what are the physical signs that it's working? The first thing that happens with continued use is the significant cleansing of toxins from the blood. Once this begins to happen people begin noticing an increased clarity of mind and overall energy. How long do I need to take ACZ nano? Once the toxins have been significantly reduced in the bloodstream, the body will then begin to eliminate toxins from tissue and bone. This process can take years. However, once you realize how much better you feel in taking ACZ nano daily, it will be easy to make a few simple sprays part of your daily routine.